running glad: Crazy or Not? Well, it is official- I am either really adventurous or an idiot. I have been sitting on the fence with wanting to try Actif Epica (a 85 mile winter endurance event on a fat tire bike in Southern Manitoba Canada) or to spend a little more time shedding my "green-ness" in the fattie world. If it was up to me, I probably would have picked door #2. But the ever adventurous-carefree- jump in with both feet husband of mine decided we should take the plunge and live life by the seat of our pants. "Actif Epica is a one-day, do-it-yourself outdoor active living celebration that will involve communities along the Crow wing Trail (part of the TransCanada Trail) in southeast Manitoba. Set against the backdrop of a 130, 162 or 200km bike or run ultra marathon in the cold weather and brutal winds of a Southeastern Manitoba winter, festival sites will glow with the warmth of community spirit, the strength of human ingenuity and the beauty of having fun whatever the temperature. 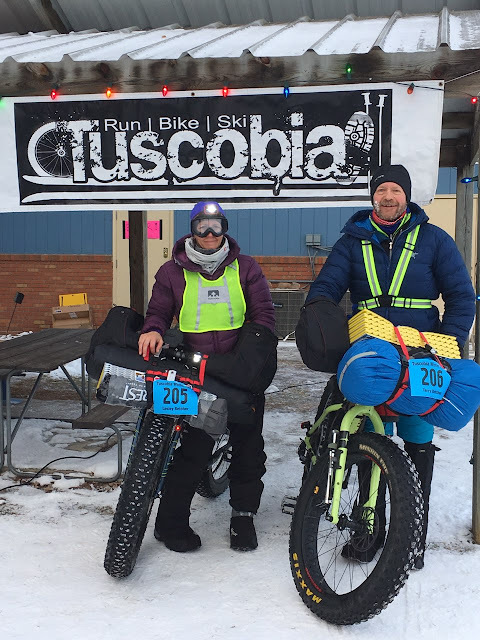 Actif Epica is a human-powered event, bringing communities together in a DIY celebration of human ingenuity in a cold (very cold) winter environment." I am very scared of getting cold; like really, really scared of being really, really cold. In the past, I have spent a lot of time on a snowmobile freezing my bageegee off and the idea of being stuck in the middle of nowhere in the freezing cold petrifies me. We had a super cold spell here the beginning of January but for the past couple of weeks, temperatures have been warmer than normal; melting, almost spring-like temperatures. We seem to be making the shift back into seasonal temps so more likely to have -5 C to -20 C on the day of the event. This gives me more confidence that the weather won't erode my self confidence. We did do some rides with the cold temps (-30 C) and now also while it has been warmer. Each ride teaches us a bit more on how to be prepared. It isn't just a case of can I make it ___ distance. The weather is a huge challenge, no doubt. There is a list of mandatory equipment to ensure our safety through extreme weather. Knowing how to dress is another huge challenge. Working up a sweat and being overdressed will immediately have negative ramifications. So dress just heavy enough while moving at a constant rate to not sweat too much. Any stops are very short as you will get cold quickly. It is also I think a bit more challenging riding a fat tired bike through winter. Different muscles sore after a fat tire bike ride. You built power riding a fattie in the winter. Snow and sand require a lot of power, strength and effort. I am so stoked to try something new and experience something different. Ideally, I want to be riding my bike into the Forks in Winnipeg toward the finish line but I am good with whatever happens that day. If I need to stop then I will. The south part of Manitoba (where the event takes place) has received an overabundant amount of snow so far this year. I expect that will make for a more challenging ride. Looking at past results, I expect it will take us 12-16 hours to complete. It is nice that the last couple hours of riding will be near and in the city. More stimulation, more lighting. And the best part is my husband and I are doing this together. The whole experience is so exciting but getting to do these things with him is priceless. I anticipate it may be the kind of event where events and challenges build relationships between people instead of competition. I know it will be an event that tests character and resilience. I know there will be tough times but I also know that I am so blessed to have the CHOICE to do things like this. So now - training. What to do to prepare? I am currently intertwining 2 different training plans right now, there isn't much extra room to add in much more. I am sticking to my "A" "B" "C" raced events and prioritizing. The spring marathon in April is my main event. The other couple events (triathlon and bike ride) are very important but I will maintain my training plan to reflect the marathon. We are trying to get 1 solid longer ride outside each week (2-5 hours) and just hope the current training fitness will be enough. Some weeks I have gotten out for a short ride after work but it hasn't been consistent. Time on the bike is important but endurance gotten from other things will be good too. The more time goes on, it seems the less I worry/get nervous/fear the actual event(race) day and the outcome. The journey getting there is fun, enjoyable, uplifting and energizing. I am becoming a person who looks more at the everyday quality of life rather than a few pivotal moments. If the outcome is what you go for- hats off to you. You are the type of person that likes to push yourself and you can handle the pressure that goes along with it. I will give it all I have on race day and leave nothing behind. I will test myself and push beyond what I think I can handle. I will learn that I am capable of so much more than I thought but I don't want to stress about the outcome. There is freedom in experiencing the "cake" part of life not just waiting to get the "icing".